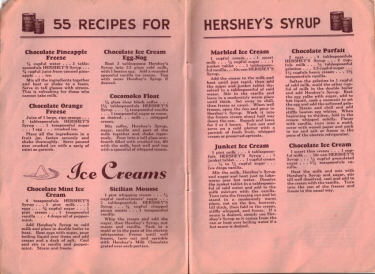 This recipe booklet from Hershey Chocolate Syrup has no date marked but I believe this was published in the 1930s or earlier and is part of my personal collection. 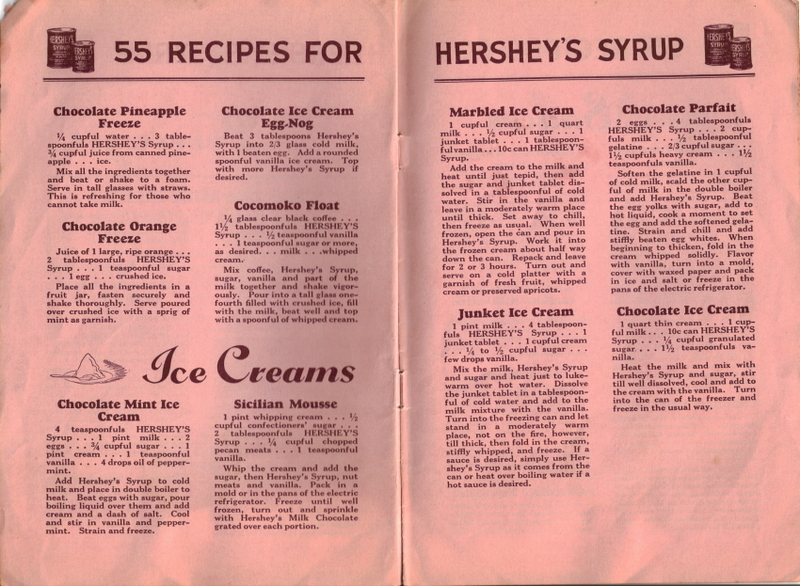 Each of the pages from this vintage cookbook are filed in the 55 Recipes For Hershey’s Syrup Category. You can read the page typed below or click on the picture to view a larger scanned copy. 4 teaspoonfuls HERSHEY’S Syrup . . . 1 pint milk . . . 2 eggs . . . 3/4 cupful sugar . . . 1 pint cream . . . 1 teaspoonful vanilla . . . 4 drops oil of peppermint. Add Hershey’s Syrup to cold milk and place in double boiler to heat. Beat eggs with sugar, pour boiling liquid over them and add cream and a dash of salt. Cool and stir in vanilla and peppermint. Strain and freeze. 1 pint whipping cream . . . 1/2 cupful confectioners’ sugar . . . 2 tablespoonfuls HERSHEY’S Syrup . . . 1/4 cupful chopped pecan meats . . . 1 teaspoonful vanilla. Whip the cream and add the sugar, then Hershey’s Syrup, nut meats and vanilla. Pack in a mold or in the pans of the electric refrigerator. Freeze until well frozen, turn out and sprinkle with Hershey’s Milk Chocolate grated over each portion. 1 cupful cream . . . 1 quart milk . . . 1/2 cupful sugar . . . 1 junket tablet . . . 1 tablespoonful vanilla . . . 10c can HERSHEY’S Syrup. Add the cream to the milk and heat until just tepid, then add the sugar and junket tablet dissolved in a tablespoonful of cold water. Stir in the vanilla and leave in a moderately warm place until thick. Set away to chill, then freeze as usual. When well frozen, open the can and pour in Hershey’s Syrup. Work it into the frozen cream about half way down the can. Repack and leave for 2 or 3 hours. Turn out and serve on a cold platter with a garnish of fresh fruit, whipped cream or preserved apricots. 1 pint milk . . . 4 tablespoonfuls HERSHEY’S Syrup . . . 1 junket tablet . . . 1 cupful cream . . . 1/4 to 1/2 cupful sugar . . . few drops vanilla. Mix the milk, Hershey’s Syrup and sugar and heat just to lukewarm over hot water. Dissolve the junket tablet in a tablespoonful of cold water and add to the milk mixture with the vanilla. Turn into the freezing can and let stand in a moderately warm place, not on the fire, however, till thick, then fold in the cream, stiffly whipped, and freeze. If a sauce is desired, simply use Hershey’s Syrup as it comes from the can or heat over boiling water if a hot sauce is desired. 2 eggs . . . 4 tablespoonfuls HERSHEY’S Syrup . . . 2 cupfuls milk . . . 1/2 tablespoonful gelatine . . . 2/3 cupful sugar . . . 1 1/2 cupfuls heavy cream . . . 1 1/2 teaspoonfuls vanilla. Soften the gelatine in 1 cupful of cold milk, scald the other cupful of milk in the double boiler and add Hershey’s Syrup. Beat the egg yolks with sugar, add to hot liquid, cook a moment to set the egg and add the softened gelatine. Strain and chill and add stiffly beaten egg whites. When beginning to thicken, fold in the cream whipped solidly. Flavor with vanilla, turn into a mold, cover with waxed paper and pack in ice and salt or freeze in the pans of the electric refrigerator. 1 quart thin cream . . . 1 cupful milk . . . 10c can HERSHEY’S Syrup . . . 1/4 cupful granulated sugar . . . 1 1/2 teaspoonfuls vanilla. Heat the milk and mix with Hershey’s Syrup and sugar, stir till well dissolved, cool and add to the cream with the vanilla. Turn into the can of the freezer and freeze in the usual way. Marbled ice cream — now why didn’t I think of that idea before? Thanks!